Show Life, Courage, Love and Strength wherever you go with this Personalized Down Syndrome Awareness Tote Bag. The innovative design of the ribbon and beautiful bright colors capture the creativity and spirit of all individuals with Down syndrome. Show your support at upcoming Buddy Walks and Awareness Events when you bring along this useful Personalized Down Syndrome Awareness Ribbon Tote Bag. 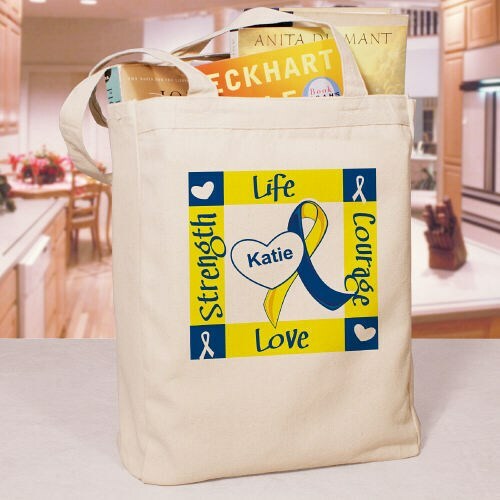 Our Personalized Ribbon of Heart Down Syndrome Awareness Canvas Tote Bag is a 100% cotton Canvas Tote Bag measuring 16"h x 14"w. This tote bag is made especially strong to hold all your take along items. Includes FREE Personalization! Personalize your Tote Bag with any name. Additional Info Our Down Syndrome Awareness Shirts and Walk Gear collection is great for fundraisers, walks, awareness campaigns, and gifts. Select from our wide variety of products designed and priced to make it easy to raise funds, create awareness, and motivate volunteers. Be sure to also walk at your next Buddy Walk event with our Personalized Down Syndrome Athletic Dept. Hat and our Personalized Down Syndrome Team Walk T-Shirt.